Are you a member of enough social media sites? It certainly overwhelms me with how many sites I am told by various gurus that I should join. Some of them really work for networking and promoting content! But there is one old tool that many of us are forgetting to use, and today we have a guest post from Peg Cannell of $table In₵ome to offer us a bit more insight. Peg consults with horse businesses to help create a stable income stream in the often volatile financial world of boarding, training, and showing. If you're interested in increasing your overall profitability in your horse business, you can contact Peg through her LinkedIn profile. During financially difficult times it is most important to offer students and their families value for their money or they will cut out lessons and shows as an unnecessary expense. This does not mean giving away your services, but offering options while waiting for economic recovery. Service is what we give in the horse business and we should never forget it. First impressions are important to attract the clientele you desire. The first exposure anyone has to your business is usually the telephone. Sadly, most small barn owners do not consider this a priority and hope that future customers will wait for the proverbial ‘hay to be put up’ before being called back. Unless they really want to come to your business for a personal reason, they will call the next barn. We have become a national of impatient consumers and it is best not to forget that. Obviously, your physical site is important too as some potential clients will drive up to see the horses. If the paint is peeling, horse manure litters the site, or things are held together with baling twine and duct tape, you may not attract the customers you desire. The best advice I can give is to take someone you don’t know well on a tour of your facility. You will see it through that person’s eyes rather than your own. passionate about. If you are passionate, it is infectious. Regardless of your specialty, it is a good idea to pick one. Within broad categories are subsets - do you train young riders only, ponies, jumpers, adults, equitation, hunters, dressage riders, reiners? Gaining a niche as being known for a subset is a long term profitable move. You will become the local expert and people will come to you. Many of us wish to be a mover-shaker in our equine world and if that is your goal and you don’t have the credentials to back it up, go work for someone who does and keep your barn closed until you are ready. The truth is, few of us make it to the very top but many of us have businesses that support us financially and emotionally. And that is what it is all about in my view. Regardless of your category or subset, regardless of your size and recognition, we all strive to have our riders and horses compete to the best of their abilities. Excellent horse management and care and a club atmosphere make clients happy. 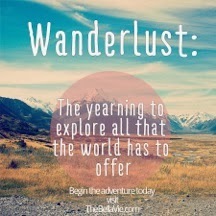 Who wouldn't want to belong? Who wouldn't want to do their best? Make that happen from the first contact on. Get someone to answer the phone! I like that Peg mentioned "from the first contact on." Remember that attaining a new customer is part of the journey, and retaining satisfied customers that will then refer more business to you is the destination. Treat the very first contact with a prospect to your business, whether that is a business card, phone call, or facility tour, as a crucial part of that journey. NOW is a great time to look at your horse business- your facility or website and its corresponding speciality (which corresponds with your unique selling proposition)- with fresh eyes and make needed changes to help improve someone's first and last experience with your horse business. 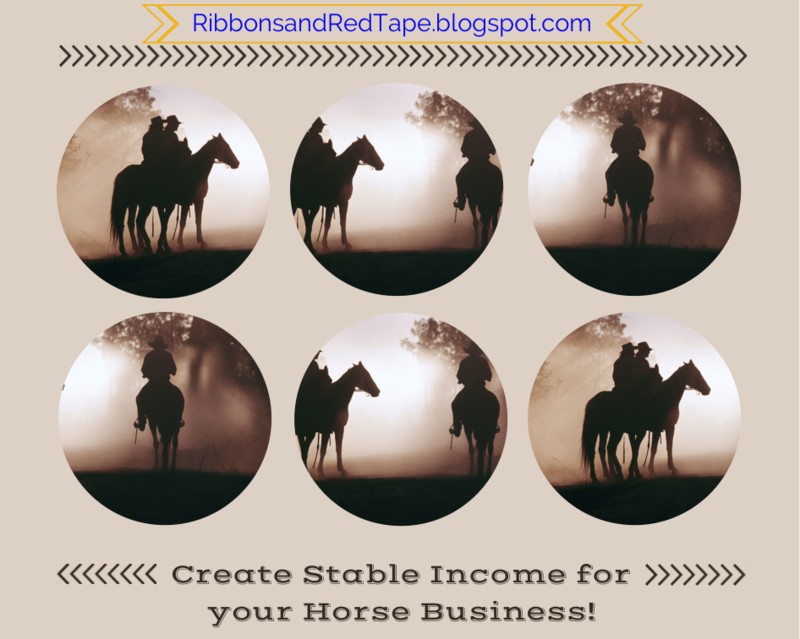 This will help you establish not only stable, but even growing, income in your horse business. Have you ever had a great first impression with a horse business that caused you to convert from just a shopper to a customer? Such as a barn that swayed you to board at that facility? If you enjoyed this post and want to stay up to date on other helpful tips for horse business owners, sign up for the FREE "Start your Horse Business Checklist" by entering your email at the top of the right hand column on our blog. Be sure to also "like" on Facebook and become a blog follower! WIN a full scholarship to the annual Equine Law Conference in Lexington, KY! As you may know, I assist the American College of Equine Attorneys non-profit. The organization wants to help support law students who are interested in pursuing equine law by paying the entrance and material costs to the annual equine law conference for a deserving applicant (a $550.00 value!). This two-day conference is amazing! I have attended 3 years in a row, you can read about some of my experiences in this post and a photo at the conference last year in this post and a Facebook album of photos here. Not only is the conference content fantastic, but the networking opportunities are phenomenal. I frequently hear equine attorneys and others in equine business such as professional appraisers, paralegals, and more laud the opportunities and work they continue to receive by virtue of networking at the annual conference. This year it is again being held at the Keeneland Race Track in the Sales Pavilion, the very site where millions upon millions of dollars have been spent in purchasing the cream of the crop Thoroughbred yearlings. I encourage you to click this link to the American College of Equine Attorneys page to learn how to apply for the scholarship (hint: it is just a touch of research and 750 typed words). Please share this post with any law students you think may be interested. Deadline is April 10, 2014, so do not delay! Let me know if you have any questions, and best of luck! p.s. I do have an existing post on this blog that may help in your essay writing! It's been so interesting to see the number of 'horse lifestyle' blogs or blogs by amateur riders hosting giveaway contests for large and small brands alike. 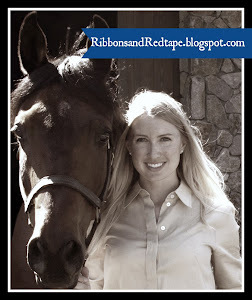 This can be GREAT equine business savvy, but there is also MAJOR legal red tape to navigate! That is a lot of requirements to entry! So have you ever been curious whether these giveaways are in compliance with the law? Or if you want to host a giveaway, have you considered whether it will violate the law? These are all separately defined and have separate federal and state laws that regulate them, and you need to know which you are hosting to make sure you are following the right restrictions. In general, you do not want to be defined as a Lottery unless you are prepared to comply with all lottery requirements. Followers are valuable! Did you know that requiring someone to like or follow you could put you into a lottery category? Also, did you know that because "time is money" that requiring an entrant to navigate away from your page, do a task, and return, that you could be requiring consideration to entry? So the MORE steps you require the MORE likely you are subject to lottery laws! It is legally untested thus far in the blog world how many steps gives rise to consideration, but the general consensus seems to be that you shouldn't require more than one simple step for entry, and that offering the opportunity of additional actions as "extra entries" may also be in violation of lottery laws. Problem: If a person is eligible to enter the giveaway, then you as the host must comply with all the laws of the jurisdiction where that person is located. Tip: If you do not want to follow the laws of every jurisdiction, then limit WHO can enter. For example, minors are treated differently under giveaway laws so you may want to restrict entry to those 18 and older. Also, Canada has very unique (and rather burdensome) laws for giveaways, so you may want to restrict entry to your country only. Problem: Lotteries are strictly regulated (think of your state's lottery system- same rules! ), so you most likely want to host a SWEEPSTAKES giveaway, not a lottery. However, CONTESTS can also be a great option if you are choosing the winner based on specific criteria and the entrant's qualification, not on chance. Tip: Follow the sweepstakes checklist below. Also, if it is a big company providing you with the product, ask them to give you their sweepstakes/ contest/ lottery rules. Remember: YOU are your only advocate and are the one responsible for protecting your own and your blog's legal interests- the big company just cares about promoting itself. If you are hosting a CONTEST, follow the checklist below but substitute #4 and #5 to match your contest requirements. 1. WHAT is the prize? 3. WHEN will the sweepstakes begin and WHEN will it end? 5. WINNER: what random process will be used to select the winner? 6. OTHER: what are the terms of the giveaway? Duplicate entries, how to ask questions, technical site issues, prize no longer becomes available, disclaimers, etc.? Taxes! Everyone's favorite legal compliance issue. If the total prize value is worth more than a certain amount of money then the prize has to bonded or insured against loss within a certain timeframe of the giveaway. This is unique to each state. As this article points out, in New York the monetary threshold is $5,000.00. IRS! Where there is financial value, the IRS invites himself over. If the prize value is more than $600.00 then the recipient must report that as income to the IRS, so entrants need to be told the value of the prize, and that the entrant is responsible for any tax liability that arises- not the host. For example, when Oprah gives someone a car, she is most likely not going to also pay the winner's taxes on the car's value. Remember how in our Copyright post for Horse Bloggers we mentioned how unchartered it is to apply traditional laws to this new online platform? Giveaways, sweepstakes, and lotteries are an even greater unchartered territory for bloggers. I know complying with all the laws isn't as fun as just throwing up a giveaway and getting a lot of likes and follows in the process- but read through this post a couple times, follow the checklist, and consider having a page on your blog with "Terms & Conditions" related to giveaways (tip: go and read the T&C of other big horse companies, like Ariat, if you are curious what it might look like). Do you ever get annoyed with some of the requirements to enter a blog contest? 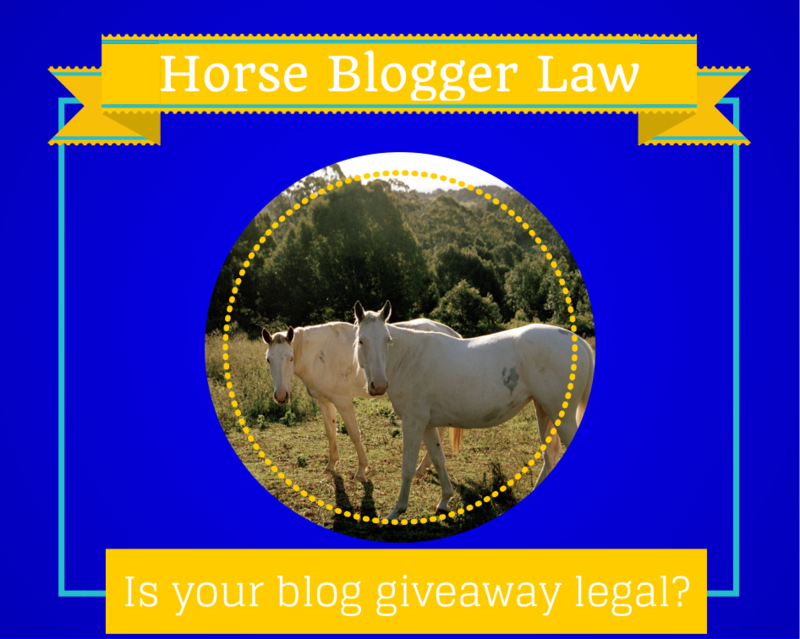 Have you ever even considered that your blog's giveaway must follow the law? If any other comments related to this developing field- let me know! p.s. there is no prize involved, but if you like this post then feel free to do one (or all!) of those 6 steps to follow this blog, google+ the post, or like the page on facebook, as listed at the top of the post! Thanks! We are so fortunate to exclusively offer We 3 Equines' very FIRST interview to Ribbons and Red Tape blog readers! Curious about the riding gloves you want to buy? 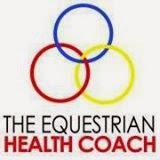 Want an honest opinion on your new horse product (and great advertising traffic for free)!? We 3 Equines is the site to visit. Read on for my interview with "the Woman," the head honcho behind the site. Ribbons and Red Tape: What is your business and what does it do? How did you get your start in the horse review business? Honestly, I created my website and blog because I wanted somewhere I could write about horse stuff. I didn't even think anyone except a handful of close friends would read it. All of a sudden I had companies contacting me asking me to review their products, and it just grew from there! I have a lot of experience in the equine industry, in many facets, and have used hundreds upon hundreds of products, so I hope that the reviews published can help horse owners find what they are looking for, without spending hundreds, or even thousands, of dollars. There are a ridiculous amount of products on the market, and sometimes you don't know if a review on a website is truly a good review or something that was paid for. I want my readers to know that the reviews I give are 100% honest, all the time. No exceptions. What have been the main legal or business hurdles in getting to where you are now? My hurdles are less legal (at this point, anyways) and more business. Do you know how many equine blogs are on the internet? A LOT. Why on EARTH would people choose to keep coming back to MY blog? I ask myself that all the time, and really work hard to try to keep it fun, engaging and present unique ideas. Another hurdle is that some people don't know that a lot of the "reviews" out there, especially if they are in a magazine, are less of reviews, and really just another form of paid advertisement. What is the W3E seal and why did you create it? 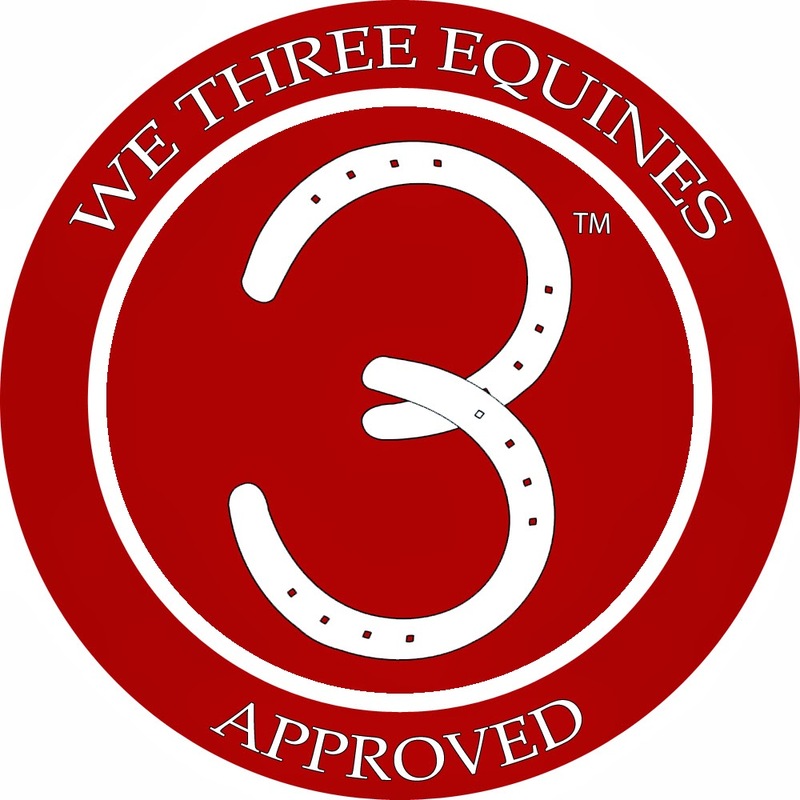 The W3E seal is the "We 3 Equines Approved™" seal, and I created it in hopes that when someone looking for a specific product sees a product with this seal of approval, they will know it's very high quality, extremely unique or effective in it's product category. It will have gone through a stringent application process to earn that seal. What does receiving the seal require? The company must send in an application with an application fee (which is returned if the product is not approved) as well as the product they wish to have approved. So, if a company has a whole line of products, each product must be individually applied for approval if they wish for more than one product to carry the seal. Just because one product in a line is approved, does NOT mean the entire line is approved. The qualifications will vary from product types. Say, for example, a company says their product is "waterproof", I make sure it actually is. I have a "stock tank test" for gloves (and yes, I do that in the middle of winter too…my hands hate me sometimes), and a "hose" or "bucket" test for apparel like jackets and boots. Grooming products that make certain claims must also submit the test/product analysis of their product if they make certain claims. If it seems like every other product on the market, then there needs to be an extremely unique feature or be highly effective to be approved. If a product fails to meet the claims, then it's not going to be approved. What types of businesses would benefit from receiving the seal? Companies that manufacture products. Things like training or concepts, etc would be very hard to administer any kind of standardized testing, since results can vary so greatly. You can't take a trainer or training idea and have the exact same results over and over. What are the traditional ways of getting this type of credibility, and why does the W3E seal a fast track to getting there? Lots of advertising, having big name equestrians endorse your brand/product etc. But again, something that some people have to keep in mind, is that this is often considered just another form of advertising as they can often be paid (or have things paid FOR) for their endorsement. Do you really think Shaq would have said he was going to Disneyland if he wasn't compensated? Of course, this isn't ALWAYS the case, but it's something people have to keep in mind about "endorsements". Of course, in argument someone could say the same for the W3E Approved™ seal, but companies aren't paying for the endorsement itself. Just because they submit an application with the fee does NOT mean their product(s) will qualify. If a business wants to get this seal or learn more, where should they go? They can visit my website and follow this link. It gives a sample application as well as information as to WHY they would want their product to bear the seal. We 3 Equines has built a robust, engaged, and growing audience- and rightly so! I find "the Woman's" voice (and her horses' voices!) to be entertaining and authentic. 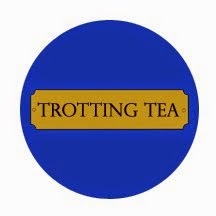 When so many horse bloggers offer one-off sponsor or product reviews I think it is reassuring that We 3 Equines has become the place to go for hundreds of different reviews. The seal of approval could be well worth your consideration if you are a business owner marketing a horse product! As a consumer or producer, you can find out about We 3 Equines' special deals and giveaways on its Facebook page. A few weeks ago I visited a barn in Santa Barbara that emanated my version of horse paradise. My version of horse paradise is where the horses and the riders seem peaceful, productive, and genuinely happy. This often includes a setting of incredible natural beauty into which the horse facilities are seamlessly integrated. As I followed my friend lead her horse down rubber matting between a long row of tall and slender palm trees, surrounded by beautiful Adobe barns hiding behind ample bougainvillea, and sat in a porch chair watching beginners hack around a quaint jump course in the nearby arena, I thought I was in horse heaven. If I were to board in Santa Barbara, I would certainly consider this barn based on the general feeling I had just being present on the property. If you ever feel like your horse business faces tough competition, brainstorm what sets you apart, which may very well be what gives visitors "just a feeling." This is often called a "unique selling proposition." 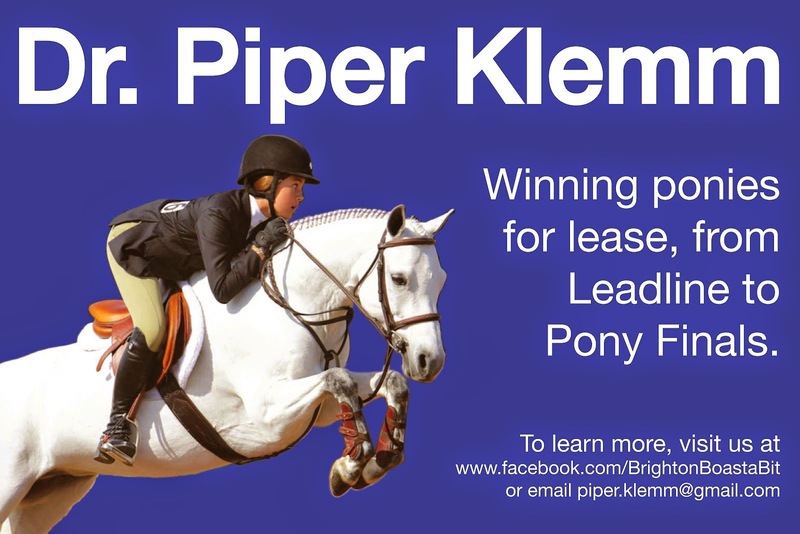 While other boarding barns may have better pasture turnout, another horse product website is clearly more advanced, or a competing horse trainer has a nicer horse and wins more at horse shows, you too have something special or unique to offer to hook more customers. If you have a hard time considering what makes your facility unique, remember that as human beings no two of us are alike, so start from there and how that translates into your business. I recently had a barn owner come to me upset that she didn't have more boarders. Rather than asking about her arenas or training program, I first asked what made her facility different than other barns. This can both trigger a renewed sense of passion for your business, "well my place is the BEST because my customer service is incredible;" or, "people tell me they love to work with me because I have so much energy for their project." This can also help horse business owners realize that you can compete by not competing. If you do not have the advertising budget or the facility budget as other horse businesses, your business or services does have aspects that make it different from any other business out there. Once you realize your "unique selling proposition" you can then focus a greater amount of your resources -your time and your money- into enhancing that particular attribute. Don't be disheartened by what you lack in your business, but take pride in the attributes that you can offer and that are impossible or difficult to find among other business owners in your niche. Once you realize your attributes you can methodologically and efficiently compound your unique effect on the market, generating clients that are drawn to your unique selling proposition, and more importantly, the passion you have for promoting the best of what you have to the horse community. Sometimes, a unique selling proposition is "just a feeling," like my experience at the Santa Barbara barn, or a feeling you get when you shop on a particular online business site. Find out what that is in your business and make it generate more clients and customers for your business! 1. Ask your current clients, your friends, and your family for the top 2 or 3 things they think makes your horse business unique from others in the market. 2. Gather genuine testimonials and reviews and share them authentically through your various word of mouth and other advertising channels. 3. Offer incentive programs to people who love your product when they share it with others who will also love your product. Do you know what is undeniably unique about your horse business? Or the horse businesses you use, like your stable or the store where you buy your horse gear? Like these posts and want more of them? Click the google+ button, or be sure that you are a follower!